We believe there’s 3 fundamental tools to build a successful sales engine. A powerful CRM that can really grow with your business and track all the interactions your reps are having with their prospects and customers. Our favorite is Salesforce. A relationship engine. There is no reason whatsoever your reps should be selling cold, there’s just too much great data and people out there to make things a bit warmer. Our favorite is LinkedIn. A communication platform that’s evolving with the time. Let’s face it, video is the new document and it’s sweeping B2B as the new form of outreach. 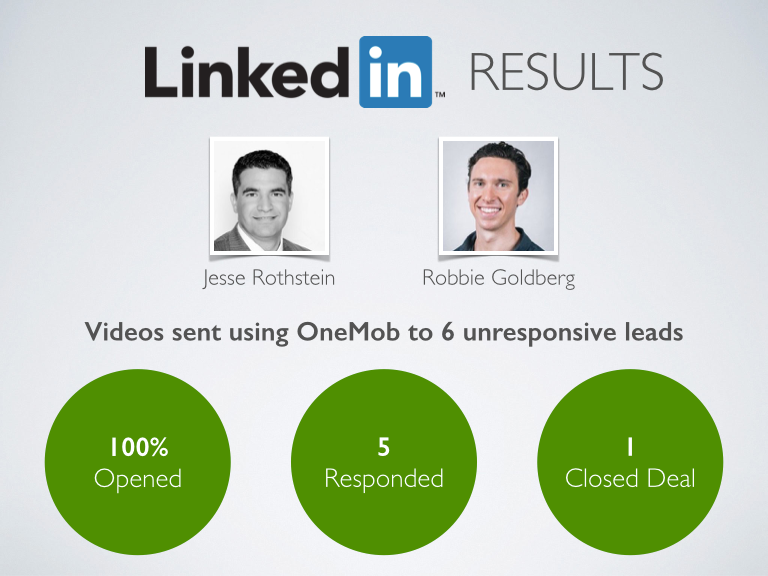 So when we had a chance to work with Jesse Rothstein and Robbie Goldberg from LinkedIn, we were so excited to see the results because they get it! We asked them to try out OneMob and tell us if it really helped them connect and sell. The results were nothing short of amazing! What really surprised them was the meaningful responses they received. Most of them apologetic for “dropping off radar” and impressed by the personal touch. But the real delight was within 3 weeks, a response turned into a breakfast meeting, which turned into a $10K proposal and ultimately closed. Nice work fellas! If you’d like to experience similar results to LinkedIn, give us a shot.